SARD Pro Meter Gauges UNIVERSAL - Dezod Motorsports Inc - Home of the automotive performance enthusiast since 2002. 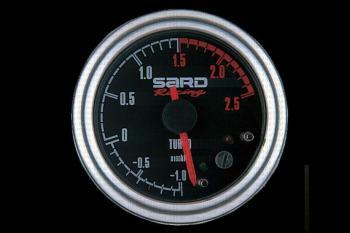 SARD Pro Meter Gauges provide highly accurate readings of critical vehicle systems and features soft Blue LED backlighting for good visibility. The electric meter feature useful functions such as Peak Hold, and programmable Alerts. The custom sensors available are the same as those used in the race cars, so added precision and durability is available with the SARD meters. Simple design keeps readouts easy to read, without distracting the driver. Available in White or Black Face.